Norwegian Cruise Lines have announced two new innovations for the Norwegian Epic, the largest chandelier at sea, and a hook up with Gibson guitars. On board the Norwegian Epic the Epic Casino will play home to the largest LED chandelier at sea. The chandelier, 21ft in length, 11ft in diameter and weighing 2 tonnes, is capable is capable of 255 different colours. British based company SMG Architects and Lighting Design are responsible for the stunning design and Austrian company Kalmar will assemble the item and it's 40,000 crystal glass pieces. Spanning vertically three decks the chandelier can be seen from the casino, Atrium, Malting's Whiskey Bar, Shaker's Martini Bar, Wasasbi Sushi Bar and the Teppanyaki Restaurant. The design consists of 112 suspended crystal encrusted balls and spiraling oval discs, each 30ft in circumference. The chandelier is the most energy efficient at sea, using over 10,000 diodes. For the rockstars in waiting NCL have teamed up with Gibson guitars to provide a guitar hire service. The Check-Inn-Rock-Out service is available for $10 a day and include a Gibson guitar, companion pod and a private amp with headphones. "We are so excited about this program," said Kevin Sheehan, Norwegian Cruise Line's chief executive officer. "We've brought world class performers to our guests on Norwegian Epic. Now, we're letting our guests be the superstars and play on world class Gibson guitar". "Our partnership with Norwegian Cruise Line will offer fans from around the world the opportunity to experience music like never before on the high seas," said Henry Juszkiewicz Chairman and CEO of Gibson Guitar. 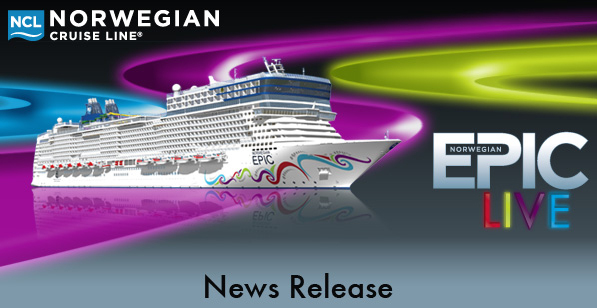 "We are delighted to be part of the global excitement surrounding the launch of Norwegian Epic and share in our mutual goals for world class entertainment." The pods, form Line 6, come with a whole host of special effects you can choose the type of music you want to are play, whether this be ZZ Top, Metallica or Johnny Cash. The Check-In-Rock-Out program had been designed so you can 'discover your inner rockstar' in the privacy of your own cabin.